These types of wasp are social and like ants and sawflies, are of the order Hymenoptera and Family Vespidae. Hymenoptera has about 6200 known species, if all the above are included, with more being discovered every year. We'll just concern ourselves with those species that directly intrude into the idyllic situation that we call "The Home". 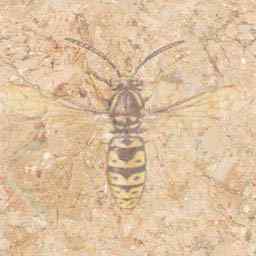 So we will deal with five or six species out of the nearly 300 types of wasp which inhabit our sunny climes. Unlike the Honey Bee, wasps have not developed methods of storing food for the winter, and this is why their colonies only last for one season in temperate regions. Each colony starts to break up in the autumn and the workers die of cold. However, before this happens new queens and males have been developed and have swarmed out of the colony to mate. The males die soon after mating, but the young fertilised females search for a sheltered spot where they can spend the winter. Such dormant queens can often be found in outhouses and lofts during the winter. As with the ants, the colonies are divided into queens, males, and workers, a bit like us really... anyway, the queens and males are only concerned with reproduction with the workers doing everything else. 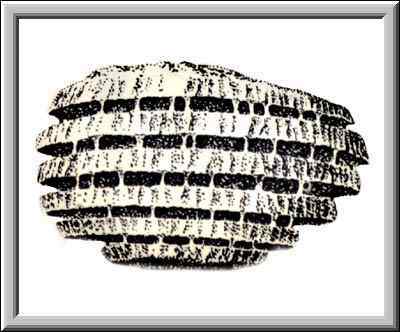 The first cell of the colony is built by the queen (who usually emerges from her winter quarters in mid-April) as there aren't any others, inside this nest the queen constructs between 10 - 20 hexagonal cells where she lays an egg in each. When these hatch the queen is kept busy for the first month feeding the larva. When the larva pupate and hatch (about the end of May) they become the workers after which the queen can concentrate on laying more eggs as the workers take over the running of the nest. In late summer, round about September, a fully mature nest can have up to 25,000 individuals in it ( Usually about 4-6000 )....not something you would want to poke with a stick. The two photographs below are from Michael Ryder in Hunstanton who suffered the ire of the queen pictured in the left hand photo....thanks very much Michael..
All wasps fed their young on meat - insect larvae, scraps of carrion and so on - and in this respect differ greatly from bees which feed their young on nectar and pollen. The wings of the prey are cut off by the workers powerful mouthparts and the remains are divided up and chewed into round food balls which are carried home to the larvae. The workers themselves (these are females with underdeveloped reproductive organs) feed on liquid food. Although wasps are fond of sweet things, they don't have the nectar sucking mouth parts of bees, but they do have very powerful jaws and a short tongue. Even so they can be seen drinking nectar from flowers and the juices of ripe fruit, and curiously enough they are also fed by the larvae. In exchange for fly flesh the larvae regurgitate a sugary liquid which the workers eagerly lick up. In addition to providing the workers with a form of energy this mutual feeding also has a social function, for it serves to bind the colony together. Wasps possess no pollen gathering apparatus and are generally less hairy than bees. Their colours are due mainly to the colours of the body plates or sclerites and not to the colours of the hairs as in bees. Towards the end of the summer, the wasps rear males and females in special large cells. Once these wasps have reached maturity, the colony begins to break up. The workers have no more larvae to feed and they turn their attention to fruit, jam, and other sweet substances, and this is when they become a nuisance. But as the weather turns cold they die, leaving only the mated queens to carry on the race in the following year and they over winter underground emerging in the spring. 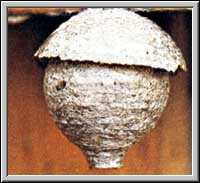 A nest which you may find in your roof space which is empty will not be reoccupied, except in the case of Hornets which can occupy the same nest although a completely new colony. A wasp uses it's sting for killing prey, but it can also use it very effectively for defending itself. The sting has associated glands which produce a venom. A Hornet sting can be very painful, but is normally not dangerous, as the amount of venom injected is very small. 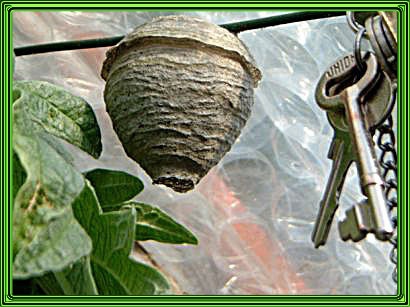 In some cases, however, people do become ill after being stung by a Hornet, or for that case any stinging insect. In very extreme cases people suffer anaphylactic shock which can prove fatal (see explanation below). A sting in the mouth or on neck can be serious, as the mucus epithelium (see below) may become very swollen, making it difficult for the victim to breathe. An ordinary uncomplicated sting can be treated with ammonia or alcohol or cold poultices, followed by an antihistimine ointment. If the victim becomes pale and feels unwell with giddiness and nausea it is advisable to seek medical advice immediately. First a warning: In no way is this a treatment, the facts discussed here are those which I have researched. Any person who feels that they are at risk or has any suspicion of any reaction must consult a DOCTOR..! THIS IS A REAL LIFE THREATENING REACTION, DESPERATE HALF MEASURES OR DELAY MAY PROVE FATAL...!!! Anaphylactic Shock is an antibody-antigen (see below for an explanation) reaction in the body which may produce a state of profound collapse. This is characterised by increasing difficulty in breathing and failure of the circulation brought about by general dilation of the small blood vessels and the escape of plasma (the clear liquid which carries the blood cells) into the tissue spaces. Anaphylactic Shock may be caused by the injection of vaccines, atisera or antibiotics, or by insect sting which is what we are concerned with. It is a desperate emergency in which "half measures" or delay may prove fatal. HYDROCORTISONE is given intravenously in large doses, accompanied perhaps by epinephrene or a similar drug. If respiratory distress is marked it is necessary to cut into the trachea (windpipe) to make an artificial opening (tracheostomy). The condition is fortunately rare. Often undue sensitivity to injected substances can be demonstrated by the use of small test doses, but even a small test dose may trigger off anaphylactic shock in a "sensitised" individual. Those who feel faint or start to swell in the face after an insect bite or sting should at once seek a doctors help, although neither of these reactions necessarily heralds anaphylactic shock. When certain foreign bodies and therefore potentially harmful substances enter the body, the body reacts to the threat by producing antibodies. An antibody is a chemical compound (protein) which has the ability to combine with and render harmless a specific foreign substance. The foreign material itself, which initiates the reaction leading to the formation of specific antibodies is known as an antigen. Epithelial tissues perform many activities in the body, ranging from protection of underlying tissues against microbial invasion, drying out, and harmful environmental factors to secretion. This is a very large subject in Human Anatomy and I'm not going to get involved, suffice to say the mucus membranes are forms of these tissues and can be affected by anaphylactic shock, thus causing difficulty in breathing. In the early months of the year when the nests are small you can get away with knocking it down with a stick or a shovel, as some people have told me they have done, but as you get towards August-September this is really not advisable, as you can tell from the information above. When nests are small, buying an insecticidal powder in a puffer pack and dusting the nest yourself is feasible, but as the months progress and the size of the nest increases it also becomes busier. Wasps have flight paths to and from the nest, so one bad idea is to stand in the wrong place, as you will get dive bombed and stung. Wasps also know when the nest is under attack and will marshal their forces from the nest and attack you. 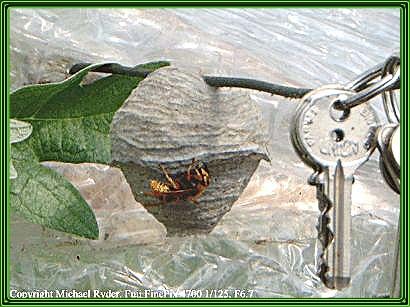 If you are stood outside the nest and you kill a wasp, say by batting it one, that wasp will give off a pheromone (scent) which will penetrate the nest giving the alarm and bringing the rest of the workers out at you. Some people have told me that they have used petrol and that it wouldn't get the better of them, and I'm not paying that much just for a wasps nest, and I'll do it myself there's nothing to it......weeeellll best of luck. To treat a mature nest takes expertise, it is a risky business especially if it is sited in a roof void. In my years in pest control I can honestly say that I have done some ducking and diving in my time. These days pest controllers are equipped with lances, some of which are up to 14 feet in length, these lances fire insecticidal powder into nests under the driving force of compressed carbon dioxide. These insecticides are mostly carbamates, a sort of powder form of nerve toxin, these are quite residual and normally not available to the public. Pest controllers also have rapid knockdown liquid insecticides which are quite expensive but very effective, again not normally available to Joe Public. The best idea at the end of the day is to get in a professional.